With its sleazy downtown jazz soundtrack, brilliantly designed backdrop, and strong thematic, After Night Falls from BetSoft is a game that is well worth a visit. As with many BetSoft games, there’s a large emphasis on feel. The action is set in some shady neighbourhood at night. There’s a burglar on the loose, and he’s got sticky fingers. Players must help the detective solve the case, and of course, there’s a big reward if they’re successful. In terms of specifics, After Night Falls has five reels and three rows. 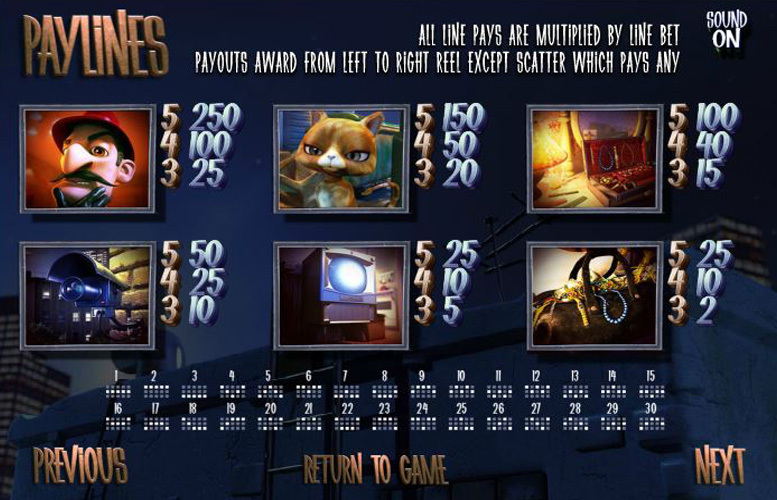 The main game prizes are low compared to many other modern slot machines but this is understandable as almost every spin seems to trigger one of the game’s special features. It’s very much a “little and often” machine, rather than a “go big or go home” affair. Great look and feel. The animation, music, and theme come together brilliantly to create a game with amazing atmosphere. Strong features. 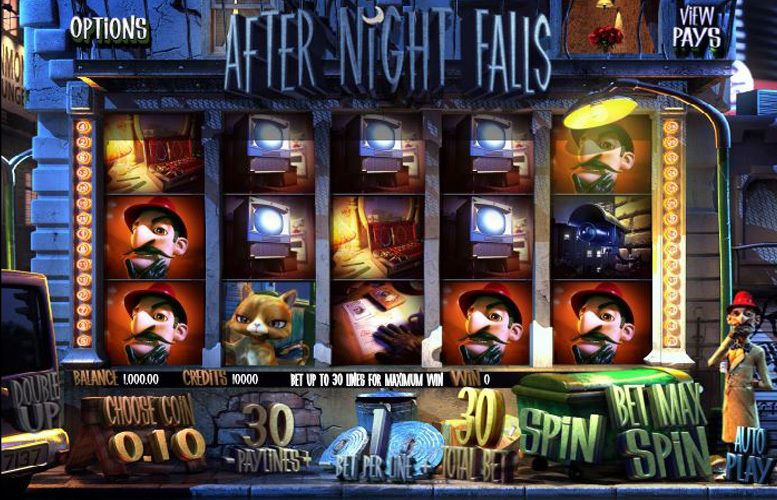 After Night Falls has many great bonus modes which make for a game with excellent replay value. Very poor main game prizes. The best five-of-a-kind only pays 250x the line bet. Some games have top jackpots of five-figures. Low upper betting limit. Players who want to seriously splash the cash will find £75 a spin much too low. Detective = 250x the line bet. Alley cat = 150x the line bet. Case of jewels = 100x the line bet. CCTC = 50x the line bet. Monitor = 25x the line bet. Bag of loot = 25x the line bet. On the highest bet level the game features a top jackpot of 1,550,000 coins. 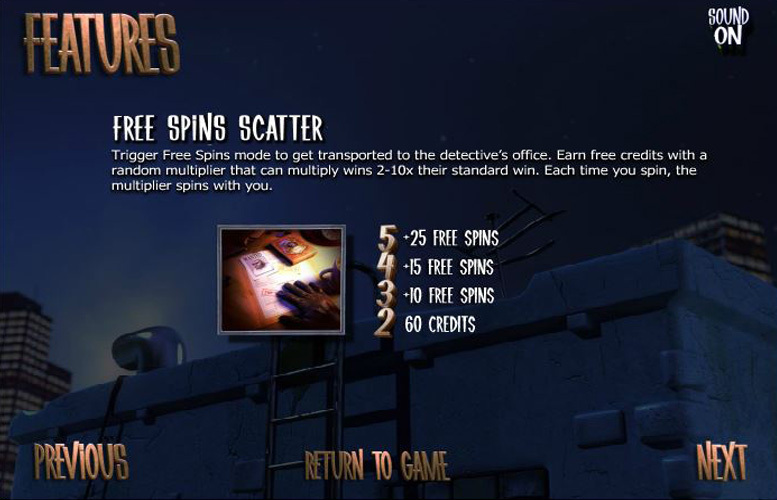 Landing three or more detective desk “scatter” symbols anywhere on the reel will trigger the Free Spin Mode. Players are transported to the detective’s office. They earn free credits with a random multiplier that can increase wins by 2-10x their standard pay table entry. Each time a spin is played, the multiplier spins with it. Landing the magnifying glass symbol in any position on the reels to activate the “moving wild magnifying glass”. 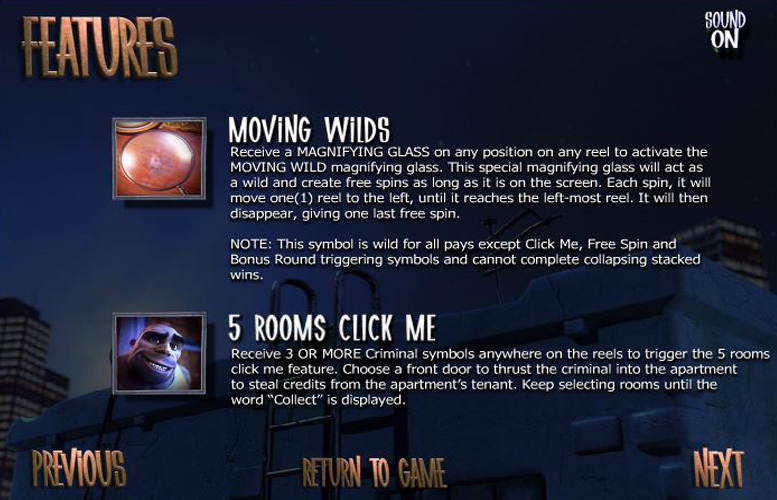 This special magnifying glass will act as a wild and create free spins if it’s on the screen. Each spin, it will move one reel to the left until it reaches the left-most reel. It will then disappear, giving one last free spin. Players should note: This symbol is wild for all pays except “Click Me, Free Spin, and those icons that trigger Bonus Rounds. It cannot complete collapsing stacked wins either. Receiving three or more Burglar symbols anywhere on the reels will trigger the “5 Rooms Click Me”. Players must choose a front door to send the criminal into the apartment and steal credits from the owner. They can keep selecting rooms until the word “Collect” appears. After any winning combination, players can elect to double their win. To double up, they must click the “Double Up” button at the bottom left corner of the main game. It’s a little bit hidden being as it’s not directly next to the spin button as is often the case. They’ll then be taken to a secondary screen where they can pick the result of a coin toss. If they’re correct, they’ll win double the prize they gambled and can repeat the toss. If they’re wrong, they lose the prize and return to the main game. When an entire reel contains the same symbol in a stack, an extra credit win will be awarded equalling 3x the symbol pay-out for that combination. Symbols collapse allowing two additional ones to drop into place. This will give additional chances to pick up wins. This feature only occurs when betting on all thirty win lines. Landing three “Granny” symbols anywhere on reels one, three, and five simultaneously will trigger the bonus round. A criminal has broken into Granny’s home and stolen her things! Players must help the detective select areas of the crime scene to inspect for clues and win credit rewards for all the evidence they can find. We’ve already covered the regular symbols to some degree on After Night Falls. Since it’s a title that places so much emphasis on its many bonus features, all the pay-outs are weighted on the low side. There isn’t the clearly differentiated “tiers” of symbols we’re used to on other games. Players can choose exactly how they want to spread their money around on After Night Falls. They can choose between one and 30 pay lines, and one and five coins to bet on each. They can also change the value of each coin bet. Coins can be worth between 2p and £1. This means, with all values set to the minimum, the lowest cost per spin is just 2p, and the highest is a rather underwhelming £75. Evidently, After Night Falls has not been designed with the highest rollers in mind. All told, this is a very solid offering from BetSoft. The animation and artwork is strong as ever from the company who are really making a name for themselves with their innovative and visually appealing products. It’s not perfect however. There are a few minor drawbacks and these chiefly relate to the upper betting limit, and well as the generally low main game prizes. That said, all BetSoft games have much lower betting limits than we’re used to from other providers (only the highest rollers will notice anyway) and the base game prizes must be so low side since After Night Falls has so many features for players to activate. This game has a rating of 4 / 5 with 516 total reviews by the users.